Rafer Jamel Alston (born July 24, 1976) also known as Skip to my Lou, is an American retired professional basketball player. He played for six NBA teams throughout his career. Alston grew up in Jamaica, Queens, New York and was a standout streetball basketball player, known for his nontraditional moves which made him particularly adept at getting past defenders while dribbling the ball. He was the inspiration in many ways for the AND1 Mixtape Tour—a low-quality, jerky 1999 videotape of Alston's extreme playground moves, featuring helter-skelter crossover and other fast dribble moves faking out defenders, attracted a great deal of attention among players and basketball fans. His trademark skipping dribble when bringing the ball down the court earned him the nickname "Skip to my Lou." Alston played basketball under coach Gregory Adams at St. Jerome School in Bronx, New York. He also played under famous high school coach Ron Naclerio at Benjamin Cardozo High School in Queens, New York. Naclerio is credited with circulating the Alston tape and getting it in the hands of AND1 staff. Alston played college basketball for three seasons: one each at Ventura College (1994–95), Fresno City College (1996–97), and Fresno State (1997–98). Alston was red-shirted at Fresno City College for the 1995–96 season. Alston struggled early in his NBA career, but successfully transitioned from streetball to the professional game. After playing off the bench for most of the time he was with the Milwaukee Bucks, he was traded to the Toronto Raptors. Following his tenure with the Raptors, he emerged as a starter for the Miami Heat in 2004. He did not disappoint, averaging 12 points and 4 assists on a young Miami team, led by rookie guard Dwyane Wade, that made it to the Eastern Conference Semi-Finals of the NBA Playoffs. During that season, in a March 26 game against the Dallas Mavericks, he hit a game-winning shot in overtime with 0.5 seconds left over the outstretched arms of Shawn Bradley to catapult Miami to a 119–118 victory. Alston would sign a multi-year deal with the Toronto Raptors in the summer of 2004. For Alston this was his first step in the new phase of a secure NBA career which had eluded him until that point. Alston was traded to the Houston Rockets for guard Mike James on October 4, 2005. Although Alston frequently was criticized for his attitude while in Toronto, it is believed that Rockets coach Jeff Van Gundy conferred with his brother, Miami Heat coach Stan Van Gundy, who coached Alston during the 2003–04 NBA season, about Alston's work ethic and attitude. Jeff Van Gundy's reputation for toughness and his ability to get the most out of players previously considered "trouble-makers" or "temperamental" (e.g., Latrell Sprewell) led to optimism on the part of the Rockets' staff. 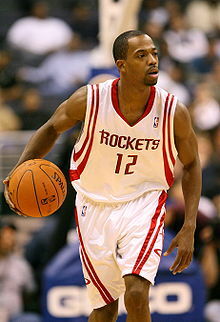 In the 2006–07 season, as the Rockets starting point guard, Alston averaged 13.3 points, 3.4 rebounds, 5.4 assists and 1.6 steals per game. He finished the season ninth in steals among all NBA players, fourth in three-pointers made, and 23rd in assists. On November 12, 2008, Alston was suspended for two games without pay for his role in a fight after a non-call foul with Matt Barnes and Steve Nash. Alston was traded to the Orlando Magic in a three-way deal on February 19, 2009, and replaced the injured Jameer Nelson in the team's starting lineup. On April 30, 2009, Alston helped the Orlando Magic defeat the Philadelphia 76ers 4–2 in the first round of the NBA Playoffs. Orlando then defeated the Boston Celtics and Cleveland Cavaliers to advance to the NBA Finals, where they lost to the Los Angeles Lakers in five games after replaced from the returning Jameer Nelson. Alston averaged 10.6 points, 3.0 assists, and 2.2 rebounds in the Finals. On June 25, 2009, he was traded to the New Jersey Nets along with Tony Battie and Courtney Lee in exchange for Vince Carter and Ryan Anderson. He had his first triple double as a member of the New Jersey Nets in 2009–2010. On January 5, 2010, he was released by the Nets in hopes of letting him play for a contender. On January 7, 2010, he cleared waivers and signed with the Miami Heat for the second time. After starting 25 games for Heat, he was immediately suspended on March 6, 2010, for missing practice and a game. On March 13, 2010, Miami upgraded his suspension for the remainder of the season. On January 26, 2011, Alston signed with the Zhejiang Guangsha in the CBA for the remainder of the season. In late February, it was reported that he had left the team to attend a friend's funeral, and the team, believing he was unlikely to return because he had been injured and refused to see a doctor, told him to not return. Alston played 8 games for Guangsha and scored average 19.2 points, 3.3 rebounds, 3.4 assists. In 2012, Alston signed with the Los Angeles D-Fenders of the NBA D-League. This would be his last run as a professional basketball player. On Sunday morning, August 5, 2007, Alston was arrested in downtown Houston on misdemeanor charges of assault and public intoxication. He was arrested again early Tuesday morning, August 28 in New York for allegedly slashing a man on the neck during a nightclub altercation. Neither the club owner, police, nor security tapes have provided any evidence of the incident occurring. The charges brought against Alston for the incident that took place on August 5, 2007, were dropped on February 29, 2008. He was arrested again on August 7, 2008, and charged with DWI. ^ Scheiber, Dave (April 17, 2009). "Former streetball star Rafer Alston has stabilized the NBA playoff-bound Orlando Magic". Tampa Bay Times. Archived from the original on 2013-12-15. Retrieved December 13, 2013. ^ a b "Teams, Leagues etc". Streetballin.net. Archived from the original on August 30, 2013. Retrieved December 13, 2013. ^ "Introducing The SLAM Legend of the Week: Rafer Alston". SLAMonline. 2018-05-27. Retrieved 2018-07-27. ^ Wharton, David (2009-06-07). "From 'Skip' to Rafer -- his ultimate crossover". Los Angeles Times. ISSN 0458-3035. Retrieved 2018-07-27. ^ Beck, Howard (April 11, 2009). "Alston Is a Key to Magic's Playoff Run". The New York Times. Retrieved March 27, 2010. ^ Stein, Marc (July 7, 2004). "Sources: Street-ball legend agrees to 6-year deal". ESPN.com. Retrieved December 13, 2013. ^ "Alston's 3 with 0.5 left in OT wins it". ESPN.com. March 26, 2004. Retrieved December 13, 2013. ^ Stein, Marc (February 20, 2009). "Magic to acquire Alston in 3-team deal". ESPN.com. Retrieved 2009-02-19. ^ "Nets Acquire Rafer Alston, Tony Battie and Courtney Lee from Orlando". NBA.com. 2009-06-25. Retrieved 2009-06-27. ^ "Heat sign Alston off waivers". ESPN.com. January 7, 2010. Retrieved December 13, 2013. ^ "CBA Recap: Guangsha Signs Rafer Alston, Stephon Marbury Returns to Shanxi". City Weekend. January 26, 2011. Archived from the original on 2013-11-14. Retrieved December 13, 2013. ^ Shoals, Bethlehem (March 1, 2011). "Did Rafer Alston Fake An Injury To Get Out Of Playing In China?". Business Insider. Retrieved December 13, 2013. ^ "D-FENDERS ACQUIRE RAFER ALSTON". NBA.com. Archived from the original on December 19, 2013. Retrieved December 13, 2013. ^ "Rockets' Alston arrested, charged with assault, public intoxication". ESPN.com. August 6, 2007. Retrieved December 13, 2013. ^ "Bridget Moynahan to Tom Brady: Take a hike". Daily News. August 30, 2007. Retrieved December 13, 2013. ^ Feigen, Jonathan (March 1, 2008). "Alston vindicated in New York assault case". Houston Chronicle. Retrieved December 13, 2013.